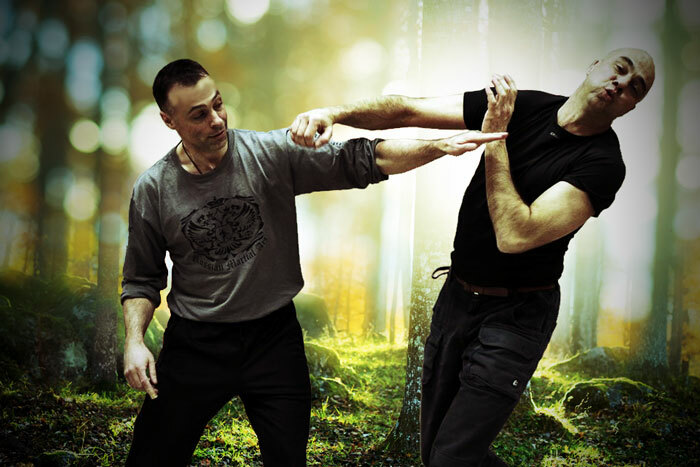 Systema is a martial art that is based on natural movement, breath and relaxation. Systema does not learn to respond to aggression with aggression, but to know yourself and to move from your own strength. The trainings are fun and challenging and there is a relaxed atmosphere. Systema means “the system”. It is a system of knowledge about yourself and it manifests itself in the training sessions as self-defense, health and personal development. Systema also has another name “poznai sebia” which means “know yourself”. Systema is an effective way of self-defense. I believe that every martial art can be effective, it always depends on the practitioner. In Systema the student learns to work with his instinctive reactions, his own build, strengths and limitations. This means that you get to know yourself better. Therefore Systema does not depend on age, condition or whether you are a man or a woman. Another question is that it is effective for daily life with the pressure, tension and other things that come your way. The beauty of Systema is that we do not answer an attack (or what the body experiences as an attack) with tension but with relaxation and this creates more possibilities. We can release tension (static energy) or give a goal (direction) so that it no longer works against us. How effective Systema is in daily life depends of course on the practitioner. Systema is simple but this does not always mean easy. Some things are easy to learn and other things can be more difficult but this is for everyone personally. The further you get in Systema the more you discover, the more information there is and what it all includes. These lessons do not only include self-defense and health but they cover the whole of daily life. Every lesson is different and even the beginning of the lesson is different every time. The structure of the lesson depends on the topics we are working on and how the practitioners are at that moment. In the trainings we work with 4 principles Breath – Relaxation – Attitude – Movement. In a training you see exercises like push-ups, squats, gaskets, clamps, punches, kicks, knife, stick, multiple attackers, etc.. In a deeper sense we work with our inner behavior on the stimulus, this determines what the body does (you really do). The training connects you with yourself, the other and the whole environment. In the training it is not about fighting but about developing. The trainings are fun and challenging and there is a relaxed atmosphere. This is a question that people sometimes ask. Why is training slow? A real attack goes fast, doesn’t it? When you start learning you start slowly, so you can really start learning (just like driving a car). With slow training, we train our muscle memory and inner actions. As soon as we start to control the actions more, we can gradually start working faster. Slow training is also very good for our health, rest and relaxation and it also ensures that we remain injury free. In the systema we do not know any bands or gradation systems as can be found for example in oriental martial arts. As my teacher said when I asked the question about gradation, “the grade is the skill you demonstrate, any time of the day”. No, we don’t work with a beginner and an advanced group. Everyone trains together at his or her own level. In the training we stimulate that training partners help each other so that both can learn and become better. If we are talking about fitness as a condition and flexibility then you can just participate. In the trainings we work on your condition and suppleness and depending on your skills you will participate and over time you will improve your condition, suppleness and ability. If we are talking about fitness when you have an illness or an injury, you can join us if you have permission from your doctor. As soon as you are allowed to train, the training we offer can help you recover from illnesses, injuries and tensions. You can strengthen and improve yourself, so that you feel comfortable in shape. The Systema trainings in all places are for adults. So the minimum age to participate in the Systema classes is 18 years. There is no maximum age. The contribution for the Systema is € 35,- per month. For this you can train Systema in Emmen, Hoogeveen, Meppel and Zwolle, so if you want you can train four times a week. You can also participate in the BM Training in Emmen in advance of the Systema training. The monthly contribution runs via a direct debit (you will receive the consent form for direct debit with the registration form). At the beginning of each month, the contribution is debited by Aiki Management. You cannot take a introductory lesson at any time. We work on a certain theme in a training and build it up for a certain time. When we start again with a new theme it is possible to take a trial lesson (this can take months). The only time that is certain for entry is the beginning of the new year and the beginning of the new season. You can take 1 trial lesson and there are no costs. However, there are some conditions to take a trial lesson. You must be physically and mentally healthy or have permission from a doctor to train if you have a certain illness or injury. So if you are interested, please contact us and we will invite you as soon as possible. Before you become a member you will first have to take a trial lesson. This is for you as well as for us, because we want you to know what you are doing. This trial lesson is also for the instructor to see if you fit in a group. After this trial lesson you can ask the instructor if you can become a member to participate weekly. If you agree, you will receive a registration form. On this registration form we ask for your contact information, but there is also a disclaimer and an automatic collection form.